Readers expecting one of my trademark rants about the new Gustavo Dudamel video game are in for a disappointment. 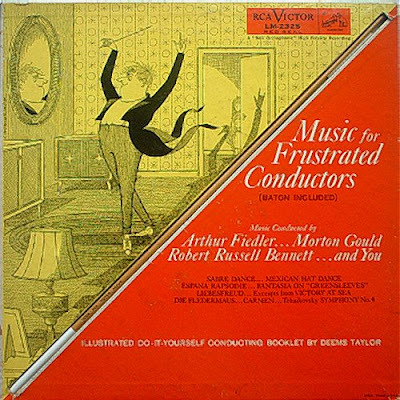 I have to confess that news of Bravo Gustavo brought back happy memories of RCA Victor's 1959 LP Music for Frustrated Conductors which came complete with authentic wooden baton and an illustrated do-it-yourself conducting booklet written by Deems Taylor. Rather than the Symphonie Fantastique featured on Bravo Gustavo the LP included Khachaturian's Sabre Dance, a movement from Tchaikovsky's Fourth Symphony, the waltzes from Die Fledermaus, and, my personal favourite at the time, extracts from Richard Rogers' score for the TV documentary series Victory at Sea, which can be sampled in the video below. Actually, home conducting may be a healthy thing, according to Manhattan Psychoanalyst Dr. Edmund Bergler: it provides the amateur with sublimating relief from the gnawing "infantile megalomania" that afflicts every man who ever wanted to lift a baton. Just more evidence that music is good for you; unless you are a musician performing new music. oh my goodness, you are serious about the GD game!some days, i wake and think I missed the train... I listen to Miles Davis and know that if I did, it's allright.Can you imagine a Miles video game?just to hear him comment as someone would butcher one of his sublime solos would be worth it, his favorite "description" as it were being an incestuous one.